Here’s a look back into the model railroading history books at a limited run kit that is not that well known. 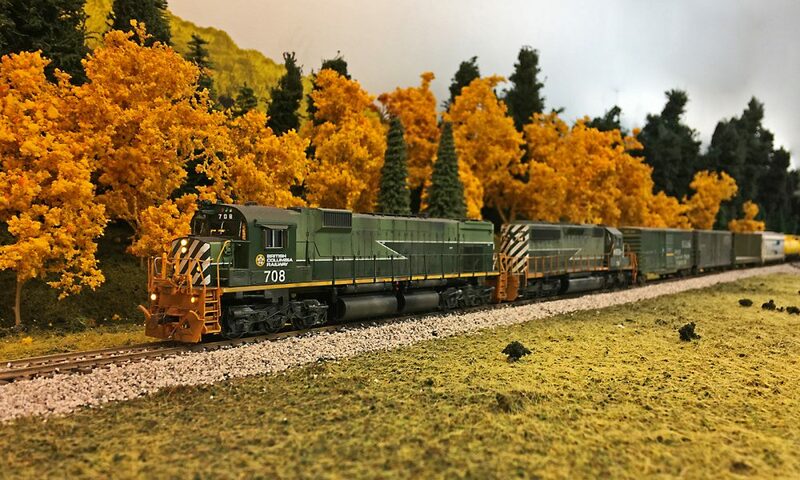 In 1994/1995 Dave Woodall produced an HO scale kit of the unique to BC Rail GMD built GF6C electric locomotive. Designed to fit on a modified Athearn SD40-2 drive, the one piece Alumilite body shell and assorted detail parts made it possible for BC Rail modellers to finally have a model of the modern coal hauling electrics. Mr. Woodall marketed the kit under the Tumbler Ridge Prototypes banner. I’m not sure how many kits were produced, however they are hard to find, and to date I have only seen one fully built up model. The only part not included with the kit was the pantographs, which were left up to the modeller to scratchbuild since at the time a matching part was not available commercially. Along with the one piece body shell in a vacuum sealed package, there are instructions, and a package with scale sized wire, presumably for the handrails. My kit came with a prototype pamphlet, copies of scale drawings from Model Railroader magazine, Microscale decals, and letters from the Quintette Operating Corperation, the District of Tumbler Ridge, and from Dave Woodall. The model in the rear is an Overland brass import, which was produced many years after the Tumbler Ridge Prototypes kit. The shell casting appears to be of good quality, with little to no flash or bubbles that I can see. The kit I have is untouched since the day it was produced, and will likely stay that way, since for now I have no desire to build it, but it is a neat conversation piece to have in the basement. I think my favorite part of the kit is the letters between Mr. Woodall and Mr. Archer, since they discuss how to build the kit and some of the challenges and limitations with the kit itself. The instructions are brief, but appear to be fairly well written, but they do mention to consult scale drawings when building the kit. I have no idea how successful the production of these kits was for Mr. Woodall, but the fact that there are not many of them out in the market today leads me to believe the venture was not very lucrative! This entry was posted in History, Uncategorized and tagged ELECTRIC, GF6C, History, kit, locomotive, model, Tumbler Ridge by tsokolan. Bookmark the permalink. I’m David from Melbourne , Australia, and I’m part of 3 working on a layout modelling the Cheakamus Gorge, & Cunninghams Cut bridge in HO. I finished constructing the bridge– challenging as it is, and now starting the long curved bridge in the Canyon. I am looking for others modelling the BC Rail in prototype fashion, and really love what you are doing, as its very inspiring ——– thank-you. When we get further along with what we are doing, we will post as well.